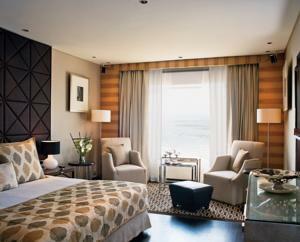 Standing tall in up-and-coming Bandra, Taj Lands overlooks the Arabian Sea. 650 ft from the seafront, it features award-winning traditional Indian spa treatments, an outdoor pool and 4 dining options. Taj Lands End is 1.5 miles from Shivaji Park and 2 miles from Bandra Kurla Complex. It is 6 miles from Juhu Beach and 7.5 miles from Mumbai International Airport. Featuring classic wood furnishings and fine beds, spacious rooms at Taj Lands End offer the comfort of marble bathrooms and a flat-screen TV. They have ample workspace and a sofa. Lands End Mumbai has a fully equipped health club. Alternatively, guests can enjoy massages and Ayurveda treatments at Jiva Spa. A visit to the sauna rooms and yoga sessions compliment the experience. Vista offers all-day dining with an international menu while Masala Bay offers a spread of Indian specialties prepared from acclaimed chefs. Other dining options include Sichuan Food at Ming Yang and the Atrium Lounge. Rooms: Hotel Rooms: 368, Hotel Chain: Taj Hotels & Resorts. Wi-Fi is available in all areas and charges apply. Free! One child under 5 years stays free of charge when using existing beds. Free! One child under 2 years stays free of charge in a baby beds. 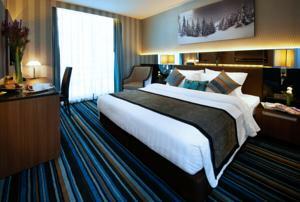 One older child or adult is charged INR 1133 per person per night in an extra bed. The maximum number of extra beds/baby beds in a room is 1. Any type of extra bed or crib is upon request and needs to be confirmed by management. Additional fees are not calculated automatically in the total cost and will have to be paid for separately during your stay. American Express, Visa, Euro/Mastercard, Diners Club, Maestro The hotel reserves the right to pre-authorize credit cards prior to arrival.